Saturday wine tastings are available only to our event attendees. 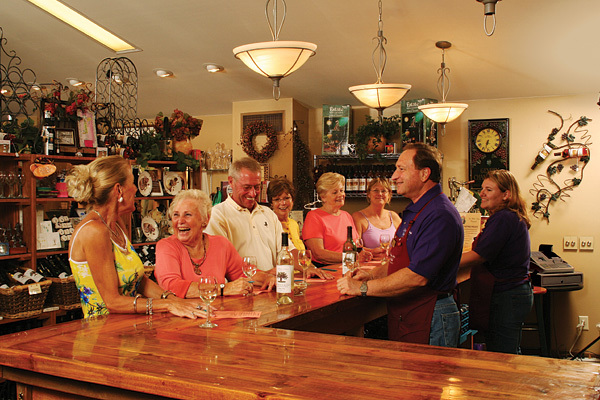 La Belle Amie Vineyard operates a tasting room in the main building of the vineyard. Guests over 21 may sample our wines prior to purchasing them. We have a variety of whites, reds, and rosés to tempt your palate. We’ll go through the five basic steps of sampling wine, and how to recognize wine varietals by their aroma and taste. Our philosophy regarding wine is quite simple–wine should be enjoyed. And anything goes! If you enjoy your red wines chilled and your white wines at room temperature then that is how you should consume them. We are well aware that each person’s palate is as unique as the tongue & nose tasting the wine. And the “best wine in the world” to one person may not at all be preferred or even liked by the next. We respect you as the best judge of what is or is not a “good” tasting wine to you, as well as how you should enjoy it. This is why we offer a wide range of wine varietals and styles—from very dry to very sweet. Cheers! –We charge $6/person (including tax) to sample any 6 wines of your choice. –Wine tastings are offered Tues. – Fri from 10am-5pm (EST). Come in anytime during those hours to sample our wines. Cheers!! HALF-PRICE THURSDAYS – Every Thursday is half-price on wine tastings….all day. $3 includes tasting, tax, and wine glass. Cheers!